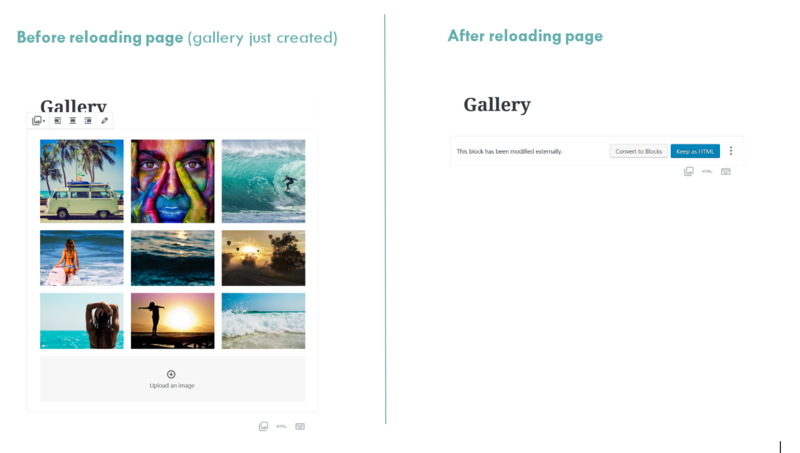 I am trying to extend the Gutenberg core/gallery block to add some new functionality to my image gallery on the frontend. I have created a separate plugin to handle this task. In my gallery-block.js file I am using the blocks.getSaveElement filter to edit the block’s HTML-output to the frontend. I am pretty sure the error occurs because my output does not correspond to the expected structure of the gallery, and thus WordPress does not see any images inside the gallery block when I reload the page. So, my question is: How can I fix this validation error? Assuming the error is caused by the difference between my HTML structure and the expected gallery structure: How can I make Gutenberg recognize my HTML structure as a gallery?